Welcome to my first blog tutorial! This is a simple design, using the Zoozii's Chunky Crystal Trio press. A popular color combination, these beads have sold extremely well for me. You will need: CIM Celadon #511402 Effetre Coral La Mesa #591420 Effetre Apricot Orange #591419 (the batch out now is much more orange, so if you can get any of the older batch it's more yellow, and Effetre Orange Zucca might be a good substitute) You will also need some silvered ivory stringer and fine silver wire, 28 or 30 gauge. Pull some 2 to 3mm stringer with the Celadon. Make a small bead out of the Coral La Mesa, about 8mm. TIP, *The glass you use first uses more* Next add right next to, and overlapping the coral, the Apricot. Melt together and press in the 14mm cavity of the press. Remember, you are going to be adding more glass, so it should not fill the cavity yet. Apply the Celadon stringer around the center of the bead, melt in and press again. Next apply silvered ivory stringer on both sides of the Celadon, melt in and press. Your bead should now fill the cavity. if it squeezes out on the corners, you have too much glass. If it's not too much, you can warm it a little and repress. Sometimes that works to smooth out the edges. Also, remember not to press too hard, let the weight of the press do the work. Now you are ready to add the fine silver wire. Holding the end of the wire and the bead just under the flame, position the wire where you want it and bring the bead slowly up the the flame until it catches on the glass. Your bead should be pretty warm too. Wind the wire around and melt off the end, then melt on the rest of the wire at the top of the flame. Make sure you melt it in good so the drops of silver won't fall off. 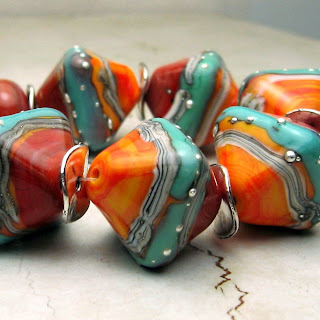 If your bead gets too roundy for your taste, you can give it another press. Pop it in the kiln to anneal.